Laura Wooten, who hasn't missed an election in 79 years, is believed to be the nation’s longest continuously serving election worker. The first time, the very first time, Laura Wooten was a little afraid. It was 1939, Wooten was just 18 years old and her hometown of Princeton, New Jersey, was, as she describes it, “very much a Northern, Southern town.” Even the black doctor who lived around the corner from her family was not allowed to treat his own patients when they were admitted to Princeton hospital. But there she stood, near the entry to the “colored YMCA,” with a list of registered voters in that precinct, a badge that identified her as a “challenger” and a pencil to mark off names. In Princeton, black people did not challenge white people in public without penalty and young black people were expected to show deference and respect at all times. Wooten, so young at the time, had been born the year after American women gained the right to vote. But as a challenger, Wooten’s role was to identify which people had voted, people who could vote but had yet to do so and deliver up to date lists to a party or campaign looking to target eligible voters and win. She was a critical human cog in a much bigger political machine. Adding to the pressure: her uncle’s name was on the ballot. He was running for Justice of the Peace. He won. As America breathes a collective sigh of relief about the end of the voting season — this time marked by an intense and hard-fought campaign season, heavy turnout on Election Day, recounts in Arizona and Florida, delayed results in Georgia and California and running, often conspiracy-laden commentary from President Trump — there are Americans who remain confident about the integrity of U.S. elections. Some, like Wooten, aren’t people who contact voters, craft campaign ads or gather pre-election opinions. They don’t tend to revel in the horserace, manipulation, scandals or games. Many are are senior citizens long involved in the logistics and details of elections. They are the people who make the essence of American democracy work. Wooten, who is believed to be the nation’s longest continuously serving election worker, has helped out at polling places or some other aspect of election administration for the last 79 years. She’s been recognized by New Jersey’s governor, the state’s League of Women Voters, the Democratic Party, and her employer Princeton University (yes, she works part time) for her election service. I’ve seen a lot. You know that elections matter. Voting matters. 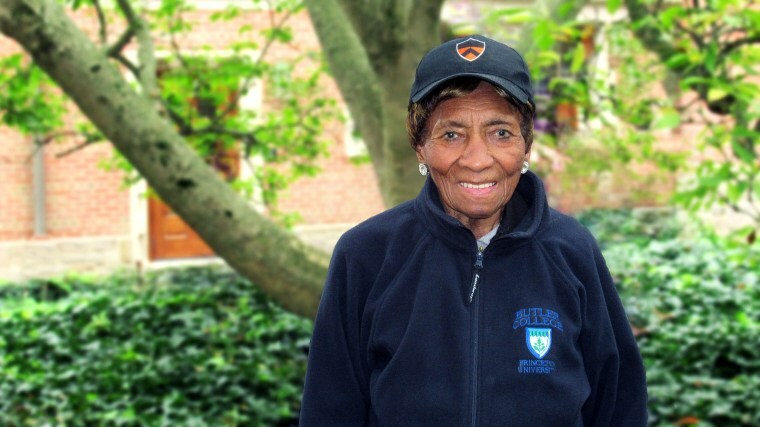 “When you are a 97 year old black women, this is a topic where you have a lot to say. You’ve seen a lot. I’ve seen a lot. You know that elections matter. Voting matters. And God willing, I’ll be right there at the Lawrence Road firehouse in Lawrence Township, New Jersey, helping out at the polls in 2020,” Wooten said. During the 2016 presidential election, 917,694 poll workers helped local election officials operate 116,990 polling places and early over 8,000 voting locations, according to the U.S. Election Assistance Commission 2016 biennial Election Administration and Voting Survey. About 56 percent of those workers were over the age of 61 and nearly a quarter, like Wooten, had reached or exceeded their 71st birthdays. Poll workers are, apparently, not easy to find. In that same election assistance commision survey, almost half of all election administrators surveyed in states around the country told federal researchers that recruiting a sufficient number of poll workers remains “very difficult” or “somewhat difficult.” Large population centers, that’s cities and big counties, experience the most difficulty recruiting. Wooten retired from her job as a nurse’s assistant at Princeton Hospital about 30 years ago and moved from Princeton to Lawrence Township a few years later when her husband died. In Lawrence Township, she lives in her own apartment, attached to a grandson’s home. She still puts in part-time hours checking student dining hall points at one of Princeton’s dining halls. “Those who can’t dedicate the day, I say the least you can do is vote. Vote every time. Let nothing and no one stop you because your vote is your voice. Staying active, Wooten said, avoiding cigarettes and, after her 70s, alcohol, have kept her mind and her body in decent shape. Among the first things she did when she made the move to Lawrence was find out how she could be of service on election days. She has worked as a challenger, a crowd manager, a counter, she’s recorded and delivered precinct results, served on a board of elections and offered any other help needed in Princeton. She wasn’t about to stop being of service after the move. In that first election in 1939, voters cast paper ballots by dropping them in boxes with slat openings. After the polls closed, Wooten and others worked to count votes by hand. On a few occasions, when there was heavy turn out and a close race, she got home around 10 p.m. Today, voting machines tally votes just after voters cast them, making elections relatively quick work. She was home before 8:30 p.m. on Election Day this year, she said. For all of Wooten’s idealism about voting, the ease and importance of helping others vote, she has heard and processed the critiques lobbed at election site workers this cycle. Trump told The Daily Caller that voters cast multiple ballots all the time simply by slipping outside of polling places and changing their clothing. But Wooten is so serious about nonpartisanship in election administration that when asked about post-midterms events, she would not mention Trump by name. New Jersey, where Wooten lives, is one of 10 states that rely on touch screen voting machines and one of five where machines generate no paper record that voters can verify. Paper records can also form the basis of a hand recount. Election experts consider voting machines which do not generate a paper record less than ideal because election machines or systems can be hacked. In August, the U.S. Election Assistance Commission announced that it would give New Jersey $10 million to help the state upgrade its machines. The state’s legislature also approved plans to use federal funding to replace all of the state’s election machines with “optical scanners,” electronic voting devices that do generate a paper record of voter choices but also tabulate votes mechanically.